Have you been searching for gambling addiction help online? Do you have a loved on in your family with a gambling addiction problem? The spirit of this site is to provide a source of information that will hopefully help you manage your individual situation. I'm continually adding information to this site, however, if you'd like to receive emails from me in the form of a Gambling Addiction ezine (i.e. newsletter), please feel free to sign up below. As I'm still in the process of building out the content for the core site, and I do have a full-time job, I'm not yet ready to begin publishing the newsletter. However, if you sign-up now, you'll be on the list to receive it as soon as it's available. I'm thinking it will likely be a quarterly newsletter. Please don't worry about sharing your email address; it will be kept private, and I will not use it to contact you for any other reason than to receive the newsletter (when it's available). Once you receive ezine there will be a link on each one for you to opt-out at anytime should you change your mind. If you do decide to signup, please note that to protect you from spam, I use a double verification process. This means that once you submit your email address, you will immediately receive an email requesting that you click on a link to verify that you wanted to sign up for the Gambling Addiction ezine. This ensures that the owner of the email address is in fact agreeing to opt-in. If you don't verify your email, your subscription process will not be completed. I Need Your Help! Do you have topics you'd like to see in the ezine? This newsletter is meant to be helpful to you, so please submit your suggestions in the form below! Your email address is NOT required, however, if I have any follow-up questions, I obviously wouldn't be able to contact you if you don't include it. Either way, I would love to hear your suggestions. Again, please be patient with me as I get the site organized; it will be some time before I'm able to publish the first newsletter. As an additional FREE gambling addiction help online resource to get you started, upon signing up for the newsletter, the confirmation email will include a link to FREE addiction treatment and recovery ebook. 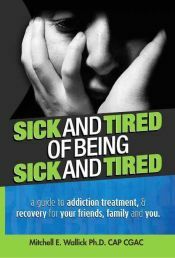 It was written by Dr. Mitchell E. Wallick (Ph.D., CAP, CGAC), and is entitled "Sick and Tired of Being Sick and Tired - A guide to addiction treatment & recovery for your friends, family and you." Dr. Mitch (as people call him) has extensive experience treating all types of addictions, including gambling addiction. For more information about this free gambling addiction help online resource, please visit Help With Addiction. Thank you Dr. Mitch for providing this valuable resource for distribution through Help-With-Gambling-Addiction.com! Lastly, please note that the ebook will in PDF format (~524 KB), and require that you have Adobe Acrobat Reader installed. You'll be able to save it your computer, print it, and read it as desired.